You are here: Home / Resources / Infographics / Are Internships Overrated? Want to share this image? You can either copy the code below and paste it in your website, or you can use one of the social sharing buttons. 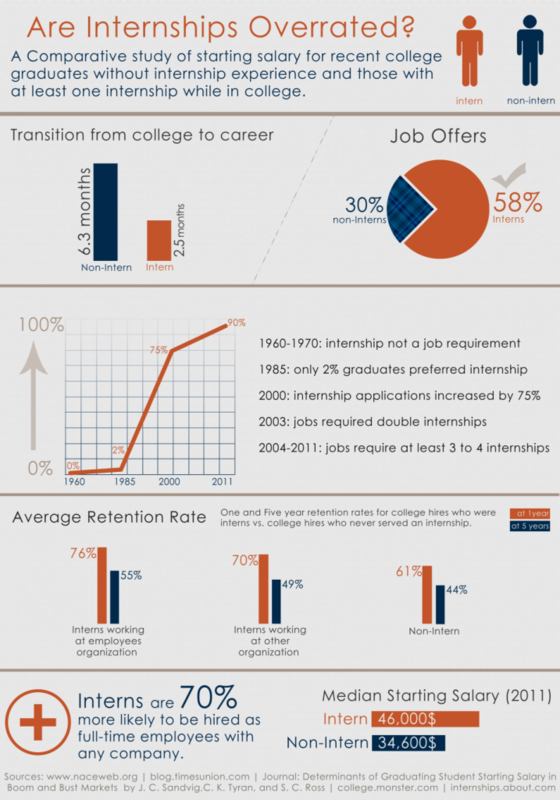 The NACE survey showed that 58 percent of interns became full-time employees. Employees have a 76 percent retention rate after one year and a 55 percent retention rate after five years. In terms of starting salary offers, according to results of NACE’s Survey. students who had internships received an average salary offer of $46,000. Meanwhile, their classmates who didn’t take internships received an average starting salary offer of $34,600.